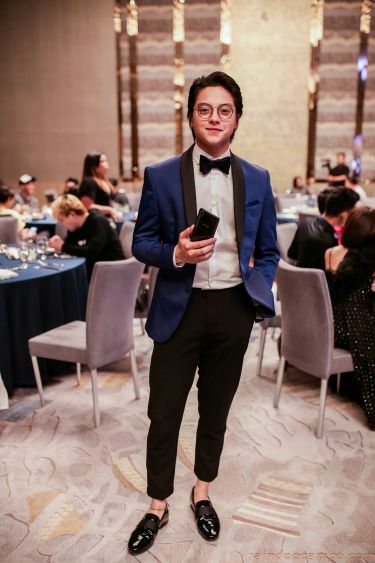 The country’s young and brightest stars aligned and came down to a once-in-blue-moon gathering to support the launch of the Vivo V11 at the Shangri-La at The Fort on September 11, adding more glitz to the brand’s most stellar night of the year. Vivo’s roster of talents was led by blockbuster actor Daniel Padilla. He was joined by fellow stars Maymay Entrata, Edward Barber, Barbie Forteza, Kisses Delavin, Iñigo Pascual, Julie Anne San Jose, Loisa Andalio, McCoy de Leon, Elisse Joson, Vern Enciso, Verniece Enciso, Maris Racal, Darren Espanto, Ashley Rivera, Kira Balinger, Chienna Filomeno, and KZ Tandingan. The launch was kicked off by Julie Anne San Jose, also known as the Asia’s Pop Sweetheart, with her powerful medley of Jennifer Lopez songs that pumped up the mood of the guests. KZ, the Soul Supreme, then closed the grand launch with a mini-concert that highlighted her vocal prowess and engaging performance. The Vivo endorsers, of course, would not let the night end without their traditional selfie with Ms. Annie Lim, the Vice President for PR and Strategy Partnerships, and Ms. Hazel Bascon, the Vice President for Sales. 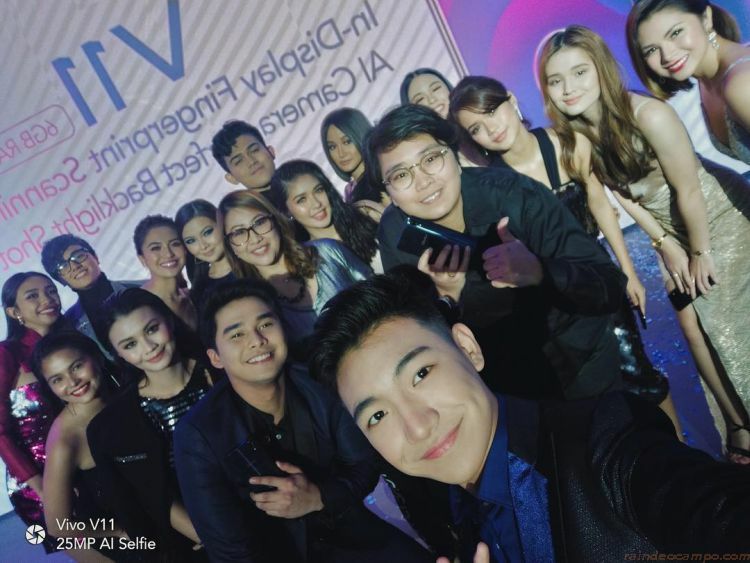 The selfie was taken by Darren who made sure that the Vivo endorsers and executives fit the frame. 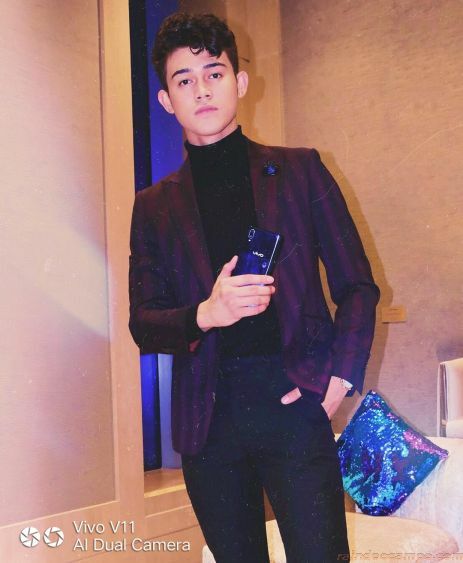 He used the Vivo V11 that features a 25-megapixel AI selfie camera that produce more vivid and vibrant photos. The program was co-hosted by Myx VJ Iñigo—along with fellow Myx VJ Ai dela Cruz—who shared the responsibility of making sure the launch stayed the course as planned. Iñigo took on the gargantuan task of hosting the launch although he was a few days away from releasing a new song and a music video. Fashion vloggers Vern and Verniece, meanwhile, guided the guests visiting the Vivo V11 Experience Area after the star-studded main event launch. Ashley, although most known for her comedic acts, showed a different side during the event when she played DJ for Vivo. Maris and Loisa also shared their talent at the launch and sang for Vivo’s partners. Maris showed off a jazzy vibe with her rendition of “Don’t Know Why,” while Loisa charmed with her sweet cover of “Starving.” The partners who were at the event were Google, Twitter, Globe, Smart, Lazada, Shopee, Akulaku, Spotify, Innity, Robinsons Malls, Ayala Malls, SM Supermalls, Under Armour, Home Credit, Cyberzone Group, Vivo Club Ambassadors, and Vivo Fans. 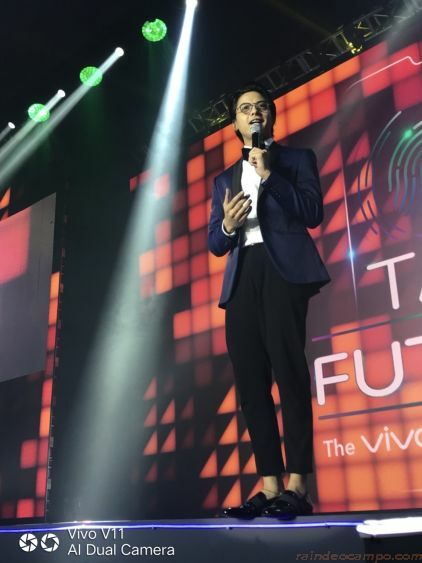 One of the highlights of the V11 night was the press conference of the endorsers where they got to share why they love the latest Vivo smartphone. Daniel could not even stop himself from gushing over the V11, especially its In-Display Fingerprint Scanner. “Who here has watched sci-fi films that showed the use of fingerprint scanning technology to unlock the smartphone? Twenty years ago, we can only watch these on films… Who would imagine that today, tonight we can do the things that we’ve seen only on films? The Vivo V11 is the future,” he said in a mix of English and Filipino. Daniel also praised Vivo V11 for its 3400mAh with Dual-Engine Fast Charging and its Qualcomm Snapdragon 660AIE Octa-core processor that improve performance for gamers like him. “This smartphone is not a joke. It is really super high-tech,” he said. Maymay and Edward, also known as MayWard, meanwhile, shared their youthful charm at the Dealers’ Night. Their fellow housemate, Kisses, also dropped by and said hi to the guests composed of dealers and distributors. The stars’ new favorite smartphone, the Vivo V11, is available for pre-order for Php 19,999. It is available on pre-order online on Lazada, Shopee, Argomall, and Akulaku as well as on ground at all participating Vivo concept stores and multi-brand stores.